Rooms from $94.64 per night. Description This Grovetown, Georgia hotel has an indoor pool, free internet access, non-smoking guest rooms and an on-site restaurant. An on-site restaurant with room service free Wi-Fi and rooms with microwaves and refrigerators are among the amenities at the non-smoking Holiday Inn Augusta West I-20. All of the 130 non-smoking rooms at the five-story Holiday Inn come with flat-panel TVs with cable free Wi-Fi microwaves refrigerators coffeemakers and desks. Newspapers are delivered to rooms on the house. Guests can visit the on-site restaurant for breakfast or dinner or order in with room service. There's a fitness center for those who need to fit in some exercise and there's a heated indoor pool with a hot tub for those who want to relax. The hotel's 24-hour business center is also convenient for keeping in touch with the office. Holiday Inn is located less than one mile from I-20. Fort Gordon is less than five miles away. Paine College Augusta State University and Augusta National Golf Club which hosts the Masters Tournament are all about a 12-minute drive. Augusta's historic downtown and landscaped Riverwalk on the banks of the Savannah River are both 12 miles. Hartsfield-Jackson Atlanta International Airport is about 145 miles from the hotel. 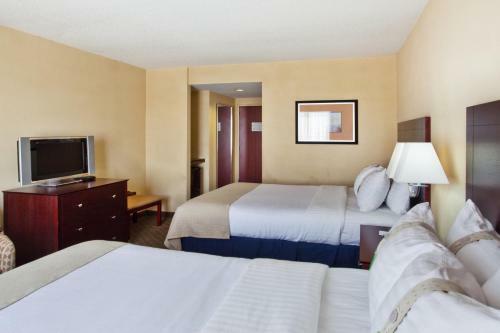 Add Holiday Inn Augusta West I-20 to your free online travel itinerary.